Since baking one million and one pizzas over the years, starting to bake homemade bread was a natural next step for me. As with my pizza, I was striving to find good methods/recipes to improve my bread-making skills. And so to begin developing my skills, I have been soaking up as much information as possible from generous bakers like Jeffrey Hamelman, Ken Forkish, Chad Richardson, and Peter Reinhart who have shared so much of their experience in the books that they have authored (more on those below). A warning though: This is not a quick bread, but the results are SO worth it. The good news is that you won’t need a mixer. This is all done by hand. No kneading required. This dough is “folded” to help develop the gluten. The dough for the bread pictured here did not include any commercial yeast (ie, packaged yeast). I used yeast that I grew as part of a starter or levain. If you already have a starter made, you can use it to make the dough on day 1 (Dough Day) and then bake the bread the next day (Bake Day). Equipment needed: a scale (essential), a kitchen thermometer (recommended brands, CDN or Taylor), a cast iron dutch oven or combo cooker (Lodge brand recommended) to help create steam and critical for oven spring, a baking stone; and of course, the ingredients. You can bake the bread without the cast iron cooker/dutch oven, but the crust won’t be same. Optional but very helpful equipment: bench knife (any brand); parchment paper, bread proofing baskets (lined are helpful); I used something like this. I believe Ken Forkish recommends the Frieling brand. Very helpful videos to get you started: Ken Forkish website (after clicking link, scroll down about three-quarters to see the videos) and a vintage video of Chad Robertson describing his technique with some demonstration. And if you have a big budget and some extra time on your hands: Try this workshop on the East Coast (King Arthur Baking Education Center) or The San Fransisco Baking Institute (SFBI) Workshops on the West Coast. I wish!! 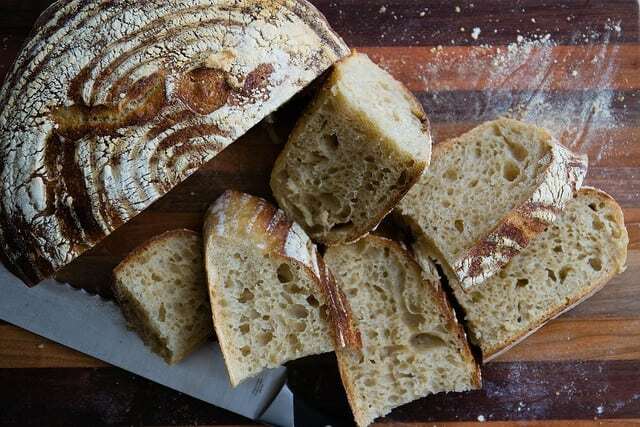 Bread ingredients and supplies: Some good sources of supplies and/or whole grains include King Arthur, SFBI (see links in previous sentence), Anson Mills, Wheat Montana, Bob’s Red Mills, Whole Foods, Amazon, or Breadtopia. I made the bread you see on this page over the weekend. Let me tell you….when this bread was baking, I could not. believe. how amazing it smelled. How I wish I could have bottled that smell and inserted a “click here” button on this site. I’m confident that you would have immediately tried this recipe!! Instead of kneading, this dough is "folded"
Do a series of folds instead of kneading the dough since this is a very wet dough. To fold, dip your hands in a bowl of water (to prevent sticking) and gently grab a section of dough from underneath, stretch it out until you feel resistance, and fold it over the top. Turn the bowl/bucket a quarter of the way around and repeat the fold and then turn the bowl again and repeat (for a total of 3 folds). Repeat these 3 folds every half hour for about 3 hours. Place them seam side down in bread proofing baskets and refrigerate overnight covered in plastic (if you want to score the loaves, place the loaves seam side up in the baskets or on a tray instead of what's shown in the video link and make sure you score them just before baking). When ready to bake, gently invert the dough onto parchment paper. Let the dough fall naturally out of the basket - do not tap or force it. Gravity will help here. 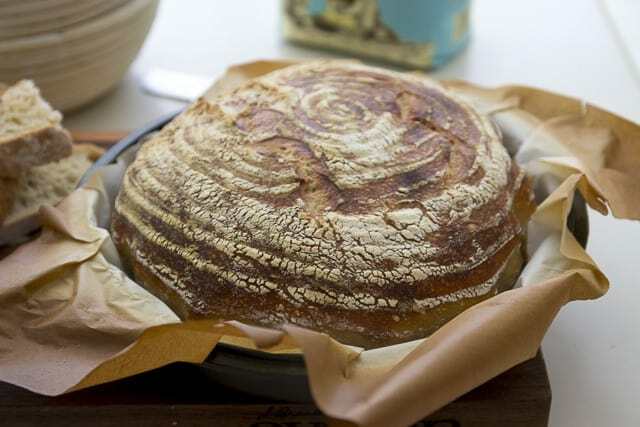 Preheat your oven to 500 degrees for about 30 minutes with the dutch oven (9.5 inch round or 11 inch oval) or a Lodge combo cooker set on top of your baking stone in the middle/lower rack (not the very bottom; this can cause the bottom of bread to burn). Immediately reduce the oven temperature to 450 degrees. Cover tightly with the lid, and let the bread steam this way for about 20 minutes; then uncover and continue to bake for another 20 to 25 minutes or until the bread has developed a nice brown color. To bake a second loaf, reheat the oven at 500 degrees for another 10 minutes, and then repeat steps 5 to 7. Just happened across your site when I was searching for, you guessed it, NY style pizza dough. Recipe printed, saved, and officially added to my to do list, btw. I’m also excited to try the Philadelphia bread and Tartine bread recipes too. I make sourdough boules pretty regularly from the Bread Bible by Rose Levy Beranbaum. I’ve made my own starter using her method, which is so, so easy if not quick. One thing that is interesting in her recipes is that you use a “stiff” starter (2:1 by weight flour to water) instead of a liquid starter. It has never steered me wrong with her recipes, but I am still working on converting other sourdough recipes for use with my starter. You should check out The Bread Bible – it has changed my baking life! Thanks for the great site. I’ll check back often. Thanks, Denise! I will check out the Bread Bible – sounds like a great book! Good question! I’d say it depends on your preferences – the taste will differ. I’ve never made the 5-minute bread, but from I’ve read it uses refrigeration to improve the flavor (like my NY pizza dough). In the recipe I posted and linked to, the flavor comes more from the starter, which is said to improve bread flavor even more than just cold proofing. That said, it is a time consuming process. 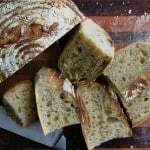 If you enjoy the process and want to learn more about baking various breads, go for it. If not, I’d say the 5-minute bread is more suitable. I’d be interested in trying the 5-minute bread myself because some days I like to spend hours experimenting but other times I just don’t have the luxury. I hope this helps…it is a very wet dough and it would be helpful to watch the videos before trying.